Your orthotics arrive in a few days so you can start benefiting from better health from the ground up. Good health starts with healthy feet. Like a house suffering from foundation settling, your spine and overall health is affected by your feet. Because of their effectiveness and affordable price, we recommend orthotics for our patients. Dr. DeMalio will scan your feet using an innovative diagnostic tool and digital casting device and determine the best option for you. Your feet feel better when all the muscles, arches and bones are in their ideal, stable positions. That’s why we often recommend the removal of the insoles that come with your shoes, replacing them with orthotics. Like a sleeping mattress, a good one is made of firm, supportive materials. Same thing with insoles. Although the soft, cushy non-supportive insoles that come with your shoes feel good, in the long run they can lead to needless aches and pains. 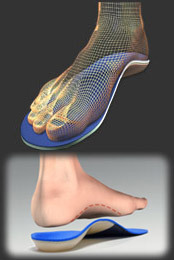 With orthotics in your shoes, your feet are being consistently balanced and supported. Instead of your feet pressing inward, stressing the surrounding muscles, joints and ligaments, orthotics help you move with a more natural gait. The way nature intended. Some patients report that at first it feels like the arch is too far back. This changes as your body adjusts. A few patients experience some discomfort in their ankle, calf or thigh. That’s only natural as your muscles learn a healthier pattern of support. Call our office, (330) 652-5600, to schedule your appointment today.